How do I check if the software is monitoring? Will it affect the computer speed when it runs? I can not find Myss.exe, where is it? Is Myss detectable by others using my PC? How to restart monitoring after stopping monitoring? Why does the program only capture screens or log keystroke? I register this program with one PC, but I want to monitor another PC, is that OK? Is there any hotkey to make the software visible? What should I do when this program is locked up by anti-virus programs or security protector? Q: What is Computer Spy Monitor Keylogger? 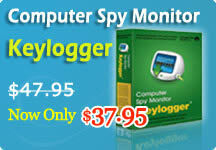 A:Computer Spy Monitor Keylogger is a powerful spy Keylogger to monitor computer activities of the users secretly. It captures screenshots of entire desktop or active windows automatically at set intervals and logs all keystrokes. This PC Spy software monitors and records all latest Windows Live Messenger / Skype / MSN Messenger / ICQ / AOL Messenger / AIM / Yahoo! Messenger's chat conversations. Q: What can Computer Spy Monitor Keylogger do for you? A: This perfect PC Spy software lets you know exactly what others do on your PC while you are away just like a surveillance camera. It is an invisible spy tool for long-term children on-line monitoring or catching a cheating spouse. Also it is suit to general office computer monitoring. Such monitoring is so secretly that the user won't know its existence. A: If you get into trouble in installation, running or other problems, you can find the answers from FAQ of this produce according to your situation, or contact us directly with Email:support@lan-monitoring.com or support@mysupersoy.com. A: Computer Spy Monitor Keylogger is demo software. You can download the trial version to test before you buy it, but the trial version have some functions limited Cit can only captures three fully pictures and logs 500 bytes typed. So if you are satisfied this program after try, please register. A: The registration code is a calculation analyses based on machine code. This is to say your registration code is sole according to your PC. A: Your machine code arises from the HD or Network Card information of your PC automatically. It can be found after you installed Computer Spy Monitor Keylogger (View below captured screen). You must offer correct machine code which arises from monitored PC; otherwise, it will affect your registration. Q: How to uninstall the trial version? A: You should execute the file "unins000.exe" in the software setup directory to uninstall the trial version of Computer Spy Monitor Keylogger. By default, the file is located at: C:\Program Files\Myss. Note: This trial version cant be activated by any registration code. Q: How to get a full version of Computer Spy Monitor Keylogger? A: After you order the program, you will receive information electronically immediately which includes the download address of full version of this computer monitoring. Q: Why doesnt my registration code work? A: All registration codes which we send according to your machine code do work. Please make sure that you enter every letter as you see it in the email with the registration code. And keep in mind that the registration code is case-sensitive and make sure that there are no spaces at the beginning or end of the registration. We suggest you select the registration code text in the e-mail window, copy to the clipboard and then paste to the program registration code box. Q: How do I check if the software is monitoring? A: Open "Windows Task Manager" (Press hotkey Ctrl+Alt+Delete) and check the "Processes" tab. If you find a process called "nvsvc16.exe" listed, this shows that Computer Spy Monitor Keylogger is monitoring your computer. Note: Your system administrator may have implemented a local policy on your computer to disable Task Manager. In this scenario, you should contact the system administrator or your help desk if you need local process control or the ability to monitor the computer's performance. A: This computer spying software is a small but efficient application. It runs in a stealth mode in the background to minimize your computer resource space, so it hardly affects your computer or other applications performance. Q: I can not find Myss.exe, where is it? A: During installation, there is no file placed on the desktop or the Start Menu. You should find the .exe file in the directory which you set when you install the software at the beginning. By default, the file is located at: C:\Program Files\Myss. Q: Is Myss detectable by others using my PC? A: Myss has a variety of stealth features that make it virtually undetectable to others. Under normal circumstance, other user of your PC could not detect Myss is running on background. A: If you want to stop monitoring, just click hotkey (default is Alt+K) and then click "Exit" button. Q: How to restart monitoring after I stop monitoring? A: If you select the function of auto run with windows startup, the program will auto run with your computer startup next time; if you dont or you want to restart monitoring at once, you should find the file called "nvsvc16.exe" and then double click it to activate the program. Q: I register this program with one PC, but I want to monitor another PC, is that OK? A: This program doesn't support this action. Because your registration code is only suit for the machine code which is sole according to your computer HD or Network Card information. If you want to monitor another PC, you can register one again. Q: Why does the program only capture screens or log keystroke? A: First check the setting parameter to insure you choose the two options: Take Screen Snapshot and Log Keystroke. Another reason is: if your computer space is less than 50M, the program will stop taking screen snapshot automatically, so you should cleanup your computer garbage often to reduce resource waste and keep enough space. Q: Is there any hotkey to make the software visible? A: Yes. Default hotkey is Alt+K. Off course, you can change it to any other keys. A: First, you should ensure that you download the updated version of the program. This computer monitor program is tested and certified completely safe and clean of adware/spyware components by many industry-leading security solutions. But sometimes it can be found by some anti-virus programs or security protectors. So if your anti-virus program or security protector find it and give you warn or lock it up, you can reset and ask for not remove. If you cant resolve the problem as this, you can contact us via email! A: Please visit www.mysuperspy.com/autorun-with-windows.htm to get more information. Thanks!